Crown Heights CSA: Register in One Week! The Crown Heights CSA is officially a go for 2009, with registration taking place this coming Sunday, April 5, at Franklin Park on St. John's and Franklin from 2-6pm. For those unfamiliar with the lingo, a CSA (Community Supported Agriculture) is an organization that collectively buys fresh produce from a local farmer. Individuals (or small groups) purchase shares, which gives the farmer the up-front cash he/she needs to tend and harvest the crop, and guarantees the buyers fresh produce for the entire harvest season. While a share usually costs a fair amount up front, most CSAs essentially offer a big box of high-quality fresh produce for $20-25/week over five-six months. Full shares for the Crown Heights CSA will cost $565 (feeds 3-5) and partial shares will cost $350. The best deal, unless you have a family, is to split a full share with friends, and the organizers will facilitate some pairing up on Sunday. The pick-ups will start June 9, also at Franklin Park, and run for 23 weeks every Tuesday from 4:00-7:30. Members will be asked to work two two-hour shifts helping to hand out produce over the course of the season. They plan to have a website up soon, but if you're interested in what will be offered you can check out the DUMBO CSA, which works with the same farmer. In order to reach as many people as possible, they've applied for grants to allow people to pay through installments (bring $100 to register on the day if you'd like to do this), and they're soliciting local artists/bakers/creators to donate items to sell in order to subsidize low-income shares as well. Email crownheightscsa@gmail.com with any queries or to get involved. Many thanks and kudos to Franklin Park, who are volunteering their sidewalk space for pickup, as well as an indoor space in case of rain, and letting the organizers store materials at the bar. Sometimes gentrification demands serious thought about hard questions (or earnest, rambling attempts at such), and sometimes you just have to shake your head and laugh. I did the latter a few weeks ago while strolling down St. Marks with some friends. 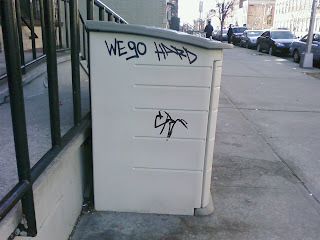 Just before the corner at Grand you have a piece of graffiti on a dumpster quoting Jay-Z's latest homage to his rough-and-tumble place of origin, and on the corner you have a Pilates Co-op. I can only assume that the tagger was on their way to an advanced pilates class when she or he stopped to pump up fellow classmates with an inspirational message for them to read as they arrived. What other explanation could there be? The bloggers on the Brooklynian Crown Heights forum got me thinking about the remaining hand-painted signs in Brooklyn, of which quite a few can be found in the outer neighborhoods of the borough. I came across this excellent specimen out on Pitkin Avenue and Doscher Street, a block east of the Euclid stop on the A-C. These signs, though individually crafted, seem to adhere to a similar template. The paint appears to be oil, probably standard exterior paints, and the signboards are sheet metal (though I don't know what sort). As one poster on the forum noted, this makes them targets for scrappers and prevents their preservation as they are gradually replaced. What I don't know is whether such signs were painted by the merchants themselves, or ordered up from local shops that specialized in the art. Signage business still exist in Brooklyn, of course (stores still have signs), but the product has changed so thoroughly that I doubt they would have any connection to the hand-painted products of yesteryear. What would be great would be to find an old hand to describe the process firsthand and point out a few of his products that still remain. A walk through Fort Greene awhile back took me past the former headquarters of Candy and Confectionery Workers Local 452, which served as the home of the Medgar Evers Head Start program until last summer, when the building went on the market. Exceedingly brief research didn't yield a date for the closure or move of the local, whose sign predates the merger of the AFL and CIO in 1955 (they've also got a great "union made" seal that looks a bit like the royal arms of the UK), but it was most likely a hopping place in the first half of the 20th century, when Brooklyn was a major manufacturer of candy. The legacy of candy manufacturing and its infrastructure looms large in the neighborhoods that surround the old union hall. Nearby factories included Barton's Candy Company at 80 DeKalb and Peaks Mason Mints Factory at 20 Henry Street, both of which are currently slated for big-time residential developments. The Pirika Chocolate Company, still standing close by on Dean between Classon and Franklin (last photo above), was one of several confectioneries that opened in the wake of the prohibition amendment, under the assumption that sweets would function as a substitute good for booze. Some former breweries were retrofitted for candy production as well. And of course, candy-making in the borough was made possible in large part by the easy access to refined sugar provided by the famous Domino refinery--soon to be condos as well--and the lesser refineries that surrounded it. I hope whoever buys the building preserves the signage. Maybe some enterprising young confectioner can open their own boutique in the space. Dine In Brooklyn, the borough's restaurant week, kicks off today and runs through April 2nd, during which time many local culinary establishments will offer three-course meals for $23 (tax and tip not included). On Franklin, Bombay Masala is taking part, offering not one but two meals for 23 bucks and a decent tip. Their standard operating procedure is the thrifty foodie's trifecta of great food in generous portions at reasonable prices, so I can only imagine that whatever specials they offer for the week will be fabulous. The eatery pictured, however, is not Bombay Masala but A Slice of Brooklyn. I ran the photo for two reasons: a) my camera remains broken and unreplaced, so stock photos are the order of the day, and b) this is my favorite place on the Avenue to grab a bite. Judy and Elwin, the owners, are the friendliest couple you'd ever hope to meet, and their food is delicious. It doesn't look like your standard greasy slice of pizza, and it isn't: the ingredients are fresh and the crust and sauce actually have a distinctive taste to them, rather than acting as mere textural platforms for a melting mountain of cheese. They've also got chewy chocolate chip cookies, a very tasty selection of homemade soups (try the lentil), and make pies with whole wheat crusts to order. The Slice isn't taking part in Dine In Brooklyn, but it's a great deal every day. I've got a basketball-sized soft spot for this place (my first day on Franklin Avenue coincided with their grand opening), so I don't claim objectivity, but if you're looking for pizza in Crown Heights, look no further. They offer free delivery for orders over $16 (347-461-9572). Two final pieces of local restaurant news: La Higenica on Sterling and Franklin has closed its doors, perhaps to make way for another restaurant (work seems to be going on inside), and Tony Fisher of Fisher's Supermarket on Lincoln and Franklin has announced that he's opening a coffee shop in the adjacent storefront (809 Franklin) this summer. I Want Candy . . . The Local published a fun little investigation of Fort Greene/Clinton Hill's Putnam Candy Store the other day, prompting links from Brownstoner and Clinton Hill Blog and this dismissive, cantankerous response from The Real Fort Greene. 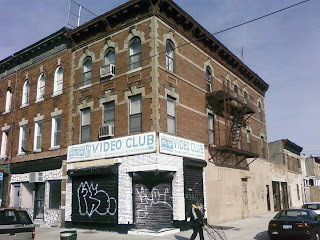 Not wanting to be left out, I figured I'd jump in with this shot of a similar retail establishment on Wilson Avenue in Bushwick. 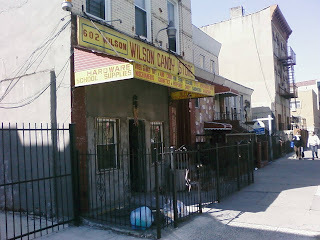 The door was slightly ajar, but from what I could see the Wilson Candy Store does not sell a terrible lot of sweets. The Putnam and Wilson Candy Stores are not unique, at least in my experience (I base this statement entirely on anecdotal evidence from wandering the borough). One or two "stores" of this ilk seem to pop up along many of Brooklyn's commercial thoroughfares, places with big signs announcing their goods but nothing much to sell. Some, like the Wilson shop pictured above and the now notorious Putnam Store, lack the big windows of a typical retail, while others, like the former restaurant/bar/barbeque joint that sits on the NW corner of Dean and Franklin, no longer even have signage. These stores may be fronts (I'm sure some are), but the fact that so many exist strikes me as a larger trend, a product of the long decline of the 1970s and 1980s when once-profitable storefronts either lost their customer base or became targets (as in the Blackout of '77). Some of the changes might also be generational: old-hand shopkeepers passing on and leaving their property to relatives with less business savvy or desire to maintain the stores. For those who retained or inherited these properties, the spaces offered room to gather away from home, either formally or informally, and they became social clubs, as one poster on TRFG called the Putnam Candy Store. What would be really interesting, speaking as a history buff, would be to sit on the other side of the door at one of these gatherings and hear what the older folks had to say about the place. 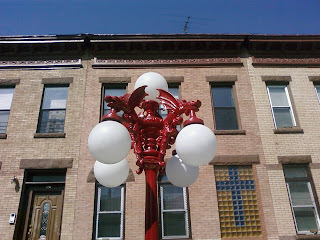 Streetlights of Brooklyn Week continues here at I Love Franklin Ave with these baroque lamps in fire engine red that shine on Central Avenue between Covert and Schaefer, as well as half a block of Schaefer south of Central. 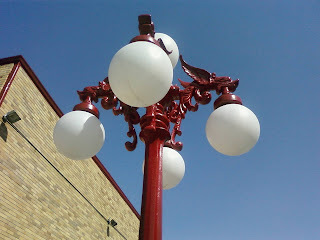 The lights, each with five globes held in place by four seemingly mythical dragon-fish, appear to be the work of Pilgrim Church and Pilgrim Christian Academy, who have also erected a wrought-iron fence and awnings in the same bright color. My investigations into the lights and the institutions behind them turned up very little. The school building, which is the older of the two, apparently once housed another school, Fourteen Holy Martyrs, which merged and moved out in the 1970s. The church and academy may continue to operate, but I couldn't find any information online. 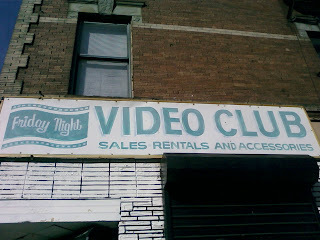 Either way, they've left one heck of a bright (day or night) legacy on their block in Bushwick. 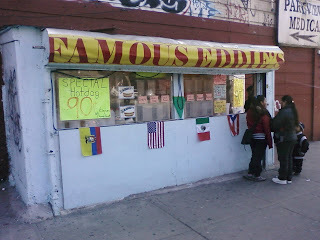 You're reading the sign in the window correctly: Famous Eddie's hot dog stand on the corner of Suydam and Knickerbocker in Bushwick offers a single dog for under a dollar. These are no run of the mill frankfurters, either--Eddie has 20 years worth of experience at various carts around the city (he owns two that operate in Times Square) and it shows. The dogs are hot and fresh, the buns are toasted to order, the kraut and onions are liberally applied, and the whole meal is offered up with the gruff efficiency that one expects of a seasoned pro. For less than three bucks ($2.75, to be precise), you can have a pair of these beauties and 20 ounces worth of pink lemonade to wash them down. 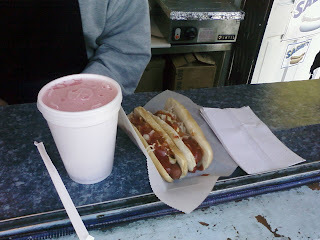 I wrote about Eddie's early in my wanderings, and I'm happy to report that my love of his food has stood the test of time. If you're looking for a quirky date that won't knock your wallet out, I highly recommend a trip up to Bushwick. You can grab your lunch at Eddie's, your dessert at the Dolceria a block east on Knickerbocker (try the gelato), and eat the whole lot across the street from Eddie on a bench in the grand plaza of Maria Hernandez Park (formerly Bushwick Park, as it is still labelled on gmaps, renamed for a community leader murdered for her aggressive anti-gang and anti-drug activism). With MTA fare, that's a $20 date for two! Who says the recession can't be more like recess? A few have been popping up since I arrived in Brooklyn, but I went away for the weekend and when I returned, they had reached a critical mass. 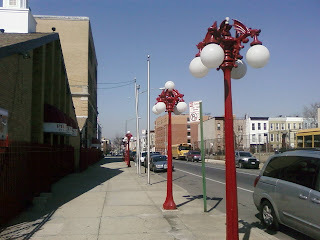 I'm speaking of the new decorative streetlights going up on Franklin Avenue, the black, angular, retro models that are replacing the standard-issue curving gray ones. In addition to being snazzy, the new lamps sit higher than the ones they replace, which purportedly will increase their capacity to light our paths. According to this posting from the Crow Hill Community Association, the lights were made possible by Assemblyman Roger Green, and were slated to start going up in 2003. Green was succeeded by Hakeem Jeffries in 2007, but presumably the funding remains. 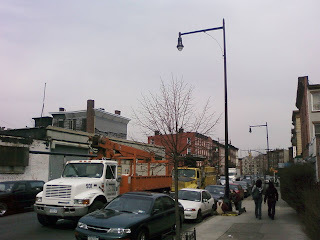 The black lamps are a handsome addition to the thoroughfare (as well as fodder for Dana Rubinstein's Crown Heights Gentrification Watch), though in places they've already been tagged and scratched. The traffic lights are also being replaced with black numbers of a similar style (no photo, sadly), which employ a pair of cables to cantilever the arms off the poles. All in all, they're a welcome new look for the Avenue, one that complements the older architecture along the street. My beloved little digital camera (the cheapest one available when I walked into Circuit City to buy one three years ago) bit the dust a few days ago, so I'm out of photos to write about. 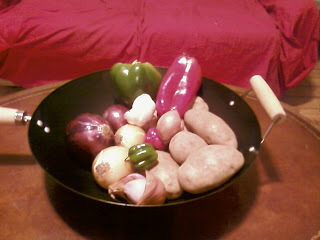 In the interim, I'll do my best to approximate pictures in prose without the usual 1,000 words/picture conversion. I was out running late last night, much later than I usually go, and I was hungry. I was hungry when I left the house, and by the time I got to my halfway point along the Brooklyn Heights promenade, I was out-and-out famished. I spent the next three miles dreaming of food, of piles of pasta and sauce and cheese, big overful mugs of beer, rows of pies and cakes like a Wayne Thiebaud painting, until I was practically drooling as I came down Vanderbilt Avenue and turned east on Fulton. And then it hit me like a cartoon anvil: the mind-numblingly delicious smell of Beigel's Bakery, which many a Clinton Hillster would immediately recognize. The aroma nearly brought tears to my eyes, and I instinctively ran towards it, turning down Waverly instead of Washington and nearly getting mown down by a passing Expedition as I blindly crossed the street to the Beigel's side. Trotting past, I inhaled deeply and turned my head skyward (does this actually improve your ability to smell or is it just something that humans do in imitation of animals? ), and when I returned my eyes to the path ahead, I could not believe them: there, less than ten feet from my watering mouth, were rows and rows of freshly baked challah, steam escaping from their pans through a wide-open door and pouring into my olfactory glands. I stopped dead and stared. Now, stealing is one of those habits or actions that people seem to come down pretty clearly on: either you don't think it's a big deal and you've occasionally lifted something yourself, or you've never even considered it and you don't think you'd steal fruit from a supermarket to survive. I'd always counted myself among the latter, but I'd never encountered fresh bread at spitting distance on a hungry run. Every possible cliche ran through my mind: "They won't miss just one loaf," "They'd never catch me anyway," "Maybe if I ask them, they'll let me have a piece." I gaped long and hard, and in so doing missed my chance to cross the line--a bearded Haisidic baker walked up and closed the door without so much as a nod in my direction. The door, blocking both the view and the passage of steam, served by its closing to break the spell, and I ambled home to gorge on whatever I had in the fridge. Henceforth, night runs will not go by Beigel's--I don't want to be the hungry runner who nicked a loaf of bread and ended up in the Post with a horrible pun next to his mug shot. 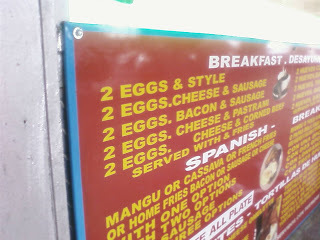 For the low, low price of $2.50, you can pick up a pretty handy intangible character trait along with a pair of eggs at El Valle Restaurant on Broadway just north of Myrtle. (I'm 98% sure this is a simple error on the part of the sign's printer, but with Brooklyn's wacky history of marketing stunts, I'm not all-in on that theory just yet). 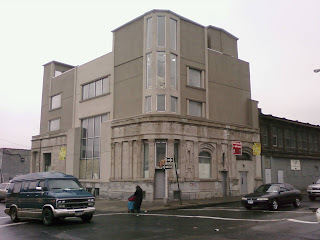 I happened upon the former Twenty-Sixth Ward Bank on the same trip that led me to the Wartburg Chapel, though this particular institution has been far better covered on Brooklyn blogs. Consequently, today's post will merely be a compendium of other articles on this strange bank-facade-condo-development mash-up that graces the southwest corner of Atlantic and Georgia Avenues. -The writer of Lost City noticed the bank on his way out to JFK, though he was only able to turn up the basic information on the bank's founding (1889) and its subsequent mergers (whatever assets it accumulated that still hold value currently belong to Chase. I found the same information here, at Bob Kerstein's New York Bank History. -The East New York Project has a far more comprehensive article on the bank, including photos of the original structure, a grand castle of orange-y brick with a greystone facade (the only part of the original structure that remains). I wonder why they decided to save only this piece, given how strange and neutered the building looks in its current iteration. Facade preservation of this sort usually results from landmark status,but I couldn't find the bank on any registry. 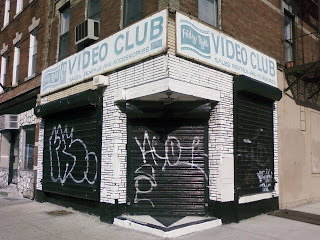 -Forgotten NY (with a working link!) has a piece about the bank and some old photos that uses its title as an introduction to the old ward system of Brooklyn. The city started with 9 wards in 1837, and kept adding them until the 1898 merger. NYC had wards as well, though they eventually went over to districts and council members. A ward is represented to the city by an alderman (a title used across genders), a system that derives from England and is still used in the USA, most prominently in that bastion of old-style urban politics, Chicago. The tiny corner of East New York between Atlantic, Jamaica, and Pennsylvania Avenues is the last place I'd expect to find a well-preserved wooden church. Squashed between a pair of avenues dominated by muffler shops and equipment rental outlets and the sprawling railyards just east of Broadway Junction, the area is barely residential, and the building stock is a mix of low-squatting modern cinder-block affairs and the occasional tattered, vinyl-sided, three-story apartment building. And yet, Brooklyn never fails to requite my love of old wooden churches, even in the most unlikely spots. The Wartburg Chapel, pictured above from the street and the platform of the Alabama Avenue J-Z stop, was built in 1875 to serve the area's Lutheran community. The East New York Project has an image from a postcard in 1962 that suggests the chapel has since been moved, along with a great anecdote from a former resident reminscing about the lovely grounds and gardens that have since been built up. Forgotten NY has something on the chapel, but I can never get their pages to load. Today, the chapel grounds are surrounded by a whitewashed fence and totally inaccessible from the street. However, the building itself still functions as a place of worship, serving the residents of the Wartburg Lutheran Home for the Aging that rises up next to it. The current owners are even trying to recreate the fondly-remembered tranquility in the churchyard: you can donate to their Garden of Peace project here. 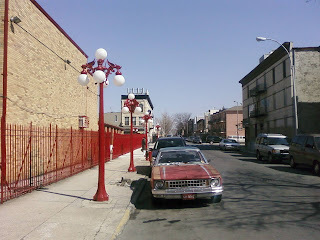 The "House of Pain," the firehouse at 582 Knickerbocker Ave, caught my attention as I passed last week. The striking modern station sits in the middle of an otherwise empty block, surrounded by a middle school's yard, which serves to highlight its dramatic shape. 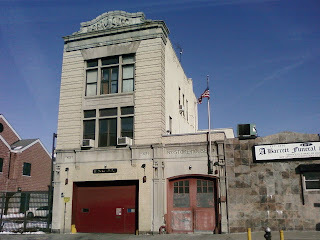 The Engine Company housed within, number 277, has had three station houses at this address since 1913. The building is also home to FDNY's Ladder Company 112, originally Ladder Company 12 in the Brooklyn Fire Department before the creation of Greater New York. Of particular interest to me was the building's vertical design, reminiscent of traditional firehouses like the "King of the Hill" station at 423 Ralph (second photo). Architects have been eschewing multi-story firehouse designs in recent years for several reasons, including safety concerns about fire poles and the disappearing need to hang canvas hoses vertically to dry (most hoses today are synthetic). New York City still maintains many stations of more than one story--real estate values haven't fallen that far, yet--but in the case of the House of Pain they clearly had the room (and city-owned land) to erect a shorter, wider station and opted for a more classic tall building. Does the new station have a pole? It's unlikely, as they've been disappearing all over. However, some companies with multi-story buildings are now using slides, which sound like just as much fun. Something interesting and unexpected I found while doing a little online research for this post: an interview with Ladder 112's captain that discusses the frequent fires in Bushwick in the 1970s. 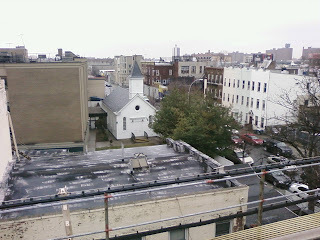 This is an unspectacular photo, a shot of a row of brownstones taken from my window on the day I moved to Brooklyn. I took it because I wanted to document this place, this fascinating melange of spaces, humanity, and history that I'm trying to make my own, at least for the present. As part of this most personal of endeavors, I've sought company, starting a blog of Brooklyn musings to plunk my drop in the bucket, to join a choir of Brooklynites who sing the borough's praises and problems. Robert Guskind, the journalist and photographer who published Gowanus Lounge and contributed regularly to Curbed, was one of the strongest voices in this chorus, a legendarily hard worker who poured two-thirds of his 24 daily hours into documenting all things Kings County. I couldn't eulogize him properly if I tried: some of the thousands who knew him better than I--which is to say at all--have already done so (Curbed, Only the Blog Knows Brooklyn, and Brownstoner, among others). I never got to meet Mr. Guskind, but he was an inspiration and a mentor to me, someone whose writing I read daily to glean both knowledge and craft, and who linked my little endeavor from his own far more comprehensive enterprise. Gowanus Lounge was the quintessential one-man blog, a wonderful cocktail of encyclopedic coverage and straightforward, honest prose that always felt local even as it ranged across the borough. Guskind produced a Platonic form for others to imitate, but from everything I've read, he never carried himself like a philosopher-king (Gary from RunsBrooklyn spoke very highly of him, and the way he helped RunsBrooklyn get noticed, here). I wish I could have met him, to thank him for reading my stuff and to thank him for writing his. Rest in peace, Robert Guskind. 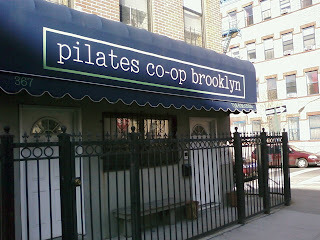 Brooklyn will sorely miss you. I may have staged the photo in my living room with store-bought veggies, but the announcement is real: starting at the end of May, organic local produce will be available in Crown Heights! In cooperation with Just Food, a local farmer will be selling shares in his or her crop this spring, and shareholders will be able to pick up a box of freshly harvested food every Tuesday night near the 2-3-4-5 Franklin Avenue stop on Eastern Parkway from May through November. Shares cost a pretty penny up front--tentative prices are $550 for a full share aimed at 3-5 people, and $375 for a partial share--but are worth it in the long run, clocking in at somewhere between $20-25 a week for high quality organic grub. Partner up with some friends to keep costs down, and both your taste buds and your conscience will thank you. For more information, or to reserve a share, email crownheightscsa@gmail.com or call 347.715.5777. MoMA Atlantic/Pacific's run is just about halfway over, and bloggers' reviews thus far have been mostly positive. The exhibit features almost all of MoMA's greatest hits on every billboard and wall, and it includes interactive pieces: a communal photoset on flickr (some great shots here), phones that can be used to call in for information on the art, and downloadable podcasts to take you through the display. It's certainly brightened up my commute, and yet I can't help but feel a little bit let down by the whole thing. It doesn't utilize the cavernous, labyrinthine station in any new way, and there's such potential in that space, with its split levels and strange angles and that soaring entrance-turned-skylight. Also, the "art" is all replicated, some pieces as plastered-on prints that show brickwork through the images, and often not in their original size. As the lady and I were discussing, these posters of familiar paintings--Starry Night, Warhol's cans, Pollock--feel more "dorm room" than "gallery." That's not to say it isn't interesting, or effective: the stunt has people buzzing, and has opened the door for all manner of commentary. The folks at Spoon & Tango compared it to the Washington Post experiment from a few years back, when concert violinist Joshua Bell took up a busker's place in a DC Metro station and played his best stuff for 45 minutes. Asking "do you have time for beauty," S&T gestured at the way both Bell's tunes and the MoMA takeover highlight the lens of context, and I think the comparison is apt, though perhaps not quite accurate. After all, Bell was really there playing his stuff, while the art is only there in replica--the equivalent, perhaps, of a recording being played or of a street musician playing a legendarily moving piece. The bloggers at Public Ad Campaign noted that the show doesn't challenge the way public space is used, but at least "can make you think of the possibilities for a newly imagined public culture." Absolut Vodka's "In an Absolut World" campaign suggested a similar re-imagining for Times Square, and both visions gesture at the transformative potential of "high art" replacing mass culture (though one does this in the pursuit of mass consumption without a trace of irony). I suppose the counterpoint would be something from the Adorno files, arguing that the media of mass culture subvert "great art" to their purposes, mangling it in the process, and that the legions of straphangers marching past the masterworks every morning are evidence to the lack of any new communal purpose. But this is all getting a bit thick and overzealous--as Brownstoner noted when it opened, the free show is ultimately an ad campaign, a "reminder that MoMA is only a short ride away." Giant neon pink stickers in the station advertise MoMA's membership and one-day fees, and the prints occupy the exact same spaces that advertisers use. Sure, I might have preferred a fascinating, brilliant use of the space by up-and-coming Brooklyn artists in an actual display of original work, but that would have been an entirely different project. All things being equal, I prefer MoMA's ads to those ubiquitous "United States of Tara" posters, and that's just it--all things, in this case, are equal. It's a show, a comment on beauty, an infusion of high culture into the mainstream (or a destruction of high culture by the mainstream), but at its core, MoMA Atlantic/Pacific is advertising. As a final aside, I found this acerbic, deliberately parochial review of the show in the Brooklyn Paper absolutely hysterical and fantastic. While it makes a few serious points (museums are competitors in a shrinking philanthropic market, etc), the bulk of the article is devoted to an all-out "get off our turf" defense of the Brooklyn Museum (whose staff, when interviewed in the piece, seemed baffled by the "declaration of war" angle) that should make anyone with snooty Manhattanite friends smile. After a handful of February days that showcased the best that global warming has to offer, March roared in like a lion. NYC's public school day was canceled for the first time in five years, which meant the joy of a few little tykes running around our office and some great photo ops on Franklin Avenue. The city fired up its fleet of 1,400 snowplows to clear the 6,000 miles of streets in the five boroughs, which the mayor compared to "plowing from here to Los Angeles and back." Based on the state of the streets in Crown Heights at 11 AM this morning, we're somewhere in Nebraska on that route, most likely on the way back. Unrelated tidbit #1: The NYTimes has kicked off a new blog for Fort Greene and Clinton Hill. Next stop Crown Heights! Unrelated tidbit #2: There's a really fascinating dialogue going on about World War II soldiers from Kings County on the Brooklynian Crown Heights message board. Kings is the second most densely populated county in the state of New York, but there's still enough room in Brooklyn for an old church and its churchyard to persist for 186 years and counting. I've got an affinity for the remaining wooden churches in Brooklyn, so when I saw this beautifully-preserved specimen from the New Lots 3 train platform, I had to scurry down and grab some photos. 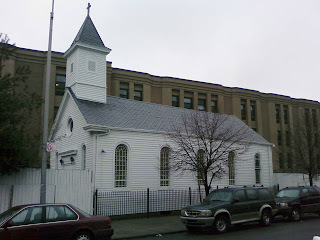 The building pictured is the New Lots Reformed Church, erected in 1823 by the Dutch farmers of New Lots because they were tired of walking nearly five miles to the Flatbush Reformed Church every Sunday. At the time, the area was a part of the town of Flatbush, and was known as "New Lots" because the land was parceled out to farmers starting in 1677, after the the "old lots" of Flatbush had been settled ("new" is, of course, a relative term). The residents whose funds and efforts got the church built are today remembered by the streets of East New York, including Abraham Van Siclen, Tunis Schenck, John Blake, and Issac Snediker. The new and old lots kept close ties, and the two churchers were variously referred to as mother and daughter congregations. The building has drawn photographers for decades (great shots from the NYPL here), and its caretakers have garnered citywide acclaim for their preservation efforts. It has been one of the 141 Brooklyn spots on the National Register of Historic Places (there's a complete account of Brooklyn's contributions to the list here) since 1983.